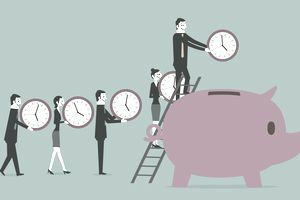 Studies and surveys are showing that millennials are waiting longer and longer to begin saving for their postcareer lives. Many don't have the easy option of employer-sponsored plans. Some are still dealing with paying off student loans, so saving is difficult. Whatever the reason, building a generous nest egg becomes significantly harder when you start later. Even if you can only contribute a little to your retirement plan at first, it’s better than nothing at all. But you'll need discipline, some guidelines, and the desire to max out your retirement savings. Statistics show that only about 25 percent of working millennials take advantage of employer-sponsored savings plans, and seven out of 10 aren't saving at all. Forty percent of those who aren't saving indicate the reason is that they don't have access to savings options through their jobs. People who do have access to employer-sponsored plans don't always qualify. They work too few hours, or they haven't been with the company long enough. Others simply don't feel that they can afford to contribute to savings, but this condition can often be fixed with a little discipline. It might mean lifestyle changes—perhaps downsizing to a less expensive apartment, taking in a roommate, or giving up that colossal satellite or cable television service. Consider taking on a second job if you're already living as cheaply as is humanly possible. It doesn't have to be forever. You might be able to pick up a side gig during the summer months or at holiday times. Just be sure to put your earnings into savings to make the time crunch worth your while. You'll definitely want to take advantage of 401(k) matching if you do have access to an employer-sponsored plan and you qualify. Otherwise, you're leaving free money on the table. Employers who offer to match your contribution will typically do so up to 3 to 6 percent of your annual salary. Find out how your employer grants a matching contribution and make sure you contribute enough money into your 401(k) to get 100 percent of your employer’s match. For example, be sure to contribute $2,500 over the course of the year if you make $50,000 and your company matches your 401(k) up to 5 percent. It’s okay to start small at first, especially when you're earning an entry-level salary. But as your income increases, so should your 401(k) contributions. Top off your 401(k) when it makes sense and get as close as possible to the maximum annual contribution allowed. It's $18,000 as of 2018. Some 401(k) plans offer automated annual contribution increases of 1 to 2 percent, which makes the process a little bit easier. You’ll barely notice a difference in your paychecks with the automation and you’ll still be paying yourself first. Why not just put all your money in the 401(k)? Because you won't want to miss out on future tax benefits. Your 401(k) contributions are tax-free in the year you make them; that money is deducted from your paychecks and you only pay income tax on what's left. But you are taxed on that money when you withdraw it in retirement. Roth contributions are not tax-deductible in the year you make them. When you open a Roth, you do so with post-tax income. You'll pay tax on the money going into the account, but all future withdrawals are tax-free in retirement, including the earnings your contributions have collected over all those years. You can contribute up to $5,500 a year to a Roth account as of 2018. In addition, you can borrow the contributions—although not the earnings—tax-free at any time and without penalty if you find yourself in a cash crunch. Just remember to put the money back later. You might want to double up if you have the financial wherewithal to do so, using both a 401(k) and a Roth account to meet your goals, or use a Roth if your employer doesn't offer a plan. But funding both a 401(k) and a Roth gives you the best of both worlds. You get a tax break and employer contributions now with a 401(k), then you get tax-free distributions from the Roth in retirement when your tax rate might be higher. Stocks have a reputation for being volatile and risky, and that can be accurate, especially in the short term. But they're typically safer over long periods of time and can produce returns in the range of 10 percent. If you begin early enough, you can build up quite a retirement nest egg in 30 to 40 years. You might want to seek expert advice, however, on what to buy and when. Conventional wisdom says that you should subtract your age from 110 or 100, and the resulting number should be how much of your savings you invest in stocks. Tuck the rest somewhere safer. For example, if you're 30 years old, you might want to devote 70 to 80 percent of your investment portfolio to stocks. There's plenty of truth to the saying that “time is money" when it comes to retirement savings. Compound interest makes the biggest difference to those who invest over longer periods of time. A word of caution, however. Make sure you have at least three months' living expenses safe and secure in a boring savings account before you begin investing for a distant horizon. This type of account won't get you where you want to go over the long haul, but neither do you want to have to dip into your retirement savings—whatever form they're in—because of job loss or some other financial emergency.